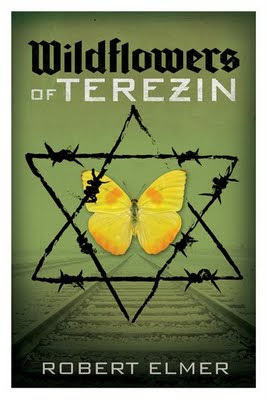 Wildflowers of Terezin is a piece of historical fiction that is set in Holland during World War II. This is also a piece of Christian fiction which is a fact I guess I didn't really pay a whole lot of attention to when I decided to read it. Realization dawned within five pages. I resolved to go for it, all the way through to the end, for the sake of my friends' recommendations. This book tells us the story of Hanne Abrahamsen, a Jewish nurse who cares more about getting other Jews out of the country and into Switzerland than she does about getting herself out. She enlists the help of a Lutheran pastor, by the name of Steffen Petersen, to help her in her endeavors. Steffen is rather an unwilling participant, having never done anything brave and daring before. However, he soon develops a passion for working with the Danish Underground in helping Jews escape. Or, rather, he develops a passion for Hanne which fuels his courage, his manhood and his ability to do right in the face of certain death at the hands of the Nazis. I found the idea of the storyline appealing. I like reading books about World War II or stories that are set in this particular time in history. Earlier this week I reviewed Villa Trista (linked) which is a story set in Italy during World War II and I found it fabulous! Wildflowers of Terezin ? Not so much. Truly, the idea for the story is a curious one. However, I didn't feel like Elmer managed to pull it off very well. Much of it I found unbelievable as Steffan, his brother, who was purported to be part of the Danish Underground (constantly showing up on the scene with bandaged body parts and black eyes), and Hanna all spoke so loosely with one another. They were quite familiar with their facts and information to almost anyone that they ran into that I had a hard time believing that they understood the grave danger that Jews were facing at that time. I rather felt that Elmer didn't know how to make his readers understand the amount of secrecy required for smuggling of Jews out of the country unless his characters spelled it out between themselves. Let's just say that I decided while reading this book that if I ever needed to be smuggled out of a country, I wouldn't want Steffan to be the man in charge. He never knew what to say to people who were suspicious of his actions. Grant it, his confusion rather suited his character but the description of his thoughts, words and actions were so weak that I found him dangerous in his own right. Then, too, I wasn't really buying the relationship between Hanne and Steffan. He, a Lutheran pastor, by all accounts a man familiar with the words of scripture and the person of Jesus Christ. She, a Jewish woman who did not know Jesus or profess him. Hanne does spend some time wondering what type of teaching surrounded this "prophet" (i.e., Jesus) touted which would make a man like Steffan risk his life for people he did not know. Yet she never professes to come to an understanding or belief. At times Elmer tried to weave in the Gospel message, trying to make it seem to Hanne that this Jesus loved so much that He would lay down his life for sinners. (It was weak and reminded me of every reason why I dislike Christian fiction.) Then, at most times, Elmer stated quite boldly that it was love of Hanne that fueled Steffan on, more than love of God. Explain to me how I'm supposed to buy the idea of a Christian pastor - who is supposed to know his scripture - falling in love with someone who clearly does not know Jesus or profess Him as Lord? This rankles me. Yes, I do see what would be appealing in this story - especially if you are a fan of Christian fiction in general. It is clean and neat and tidy, despite the fact that it is partially set in a Jewish prison camp. The horror of war is not remotely clearly expressed in this story, as it is in others. In fact, I'd go so far as to say that you are welcome to ignore the war entirely and lose yourself in the love story, such as it is. I suppose I just did not find it very remarkable or well-told. Also, I feel I've paid my dues to Christian fiction for awhile yet. I have some of the same issues with Christian fiction, which is why I pretty much don't read it. However, I try not to throw the baby out with the proverbial bathwater, either. I think the idea of a Christian pastor falling in love with a Jewish woman isn't totally unheard of in this world, actually. Is it right, necessarily, or wise, or following the Biblical mandate? No. But isn't that the problem with Christian fiction. . . it's too neat and tidy and perfect? My question would be this: does he express inner conflict over it? That would be the deal-breaker for me, I think. But the bit about him having loose lips. . . that wouldn't fly with me, either. Thanks for the review. I had been interested in the story, but I'm pretty sure I'd feel similarly to you about it. I trust your judgement so much and fear I'll feel the same way. Bumping this book farther down my list. . .
@Amy - No, he has no inner turmoil or conflict over it. Also, the senior pastor of his church still attends to oversee his teaching and act as an adviser from time to time. He offers no advice on that score either, which also bothered me. Wow. I'd heard such good things about this book. It's on my to-read list but I might have to rethink it. The same issues that gave you trouble would make me frustrated as well and I've been disappointed with too many three star reads... I'm starting to drop books faster now when they look like they will be mediocre. Too many good books to read to waste time on tons that aren't great! Well, what can I say. :-) I guess we'll have to agree to disagree on this one. I do remember a sense of secrecy as they smuggled people, especially in one scene where Steffen is rowing people somewhere, concerned that their voices will give them away, then rowing back by himself and hoping not to be discovered. When Hanne first encountered him, she thought he was part of the resistance, which was why she spoke more loosely to him, but after that there was no need for secrecy between the three of them. I "bought" the love story -- it is not unheard of for a Christian to fall for a Jew. I did get the impression that she came to believe, though it was not spelled out. It has been a while since I read it, so I can't remember the specifics, but I thought it did portray the grimness of the war to a degree. Not as much as other books, surely, but that wasn't the prime focus of the story. I'm sorry you didn't like it. :-) I think partly, too, when something is praised highly by others, it can fall a little flat because expectations are raised. That's how I felt about Downton Abbey (finally started watching.) It seemed a little soap operaish in some of its plot lines at first, and I was disappointed in it, but I did like the historical aspects, and it grew on me. I'm glad you said what you did! Though I enjoyed it, I didn't realize it was Christian fiction for a long time. I didn't find a Lutheran pastor falling in love with a Jewish woman to be a deal-breaker, but I did wonder why there wasn't more inner conflict. (But as I said, I didn't realize it was Christian fiction.) I did wonder how much of the pastoring was more job than conviction...as I think it was for many 100+/- years ago. I had forgotten that I was annoyed about the loose lips, esp around the store. But I think I enjoyed the overall story enough that I let it go. Well, that's too bad. I giggled about you liking the end, but not just because it was the end.